We’ve already tackled the question about YouTube for Marketers recently, and I’ve been a big believer in it for a number of years. In fact, business owners and entrepreneurs in our 21st-Century Strategic Marketing Program have heard me beat the drum of not just YouTube, but also social media outlets (including Facebook and Twitter) since the program’s inception in early 2008. Clients are now asking about social media more than ever before, particularly as we help them develop comprehensive marketing and communications strategies that they in turn get busy implementing. In my opinion, the number of businesses who should not be using social media is rapidly diminishing. If you own a small business, if you are a salesperson, or if you in any way are responsible (or rewarded) for bringing customers or revenue into the company you work for, then you need to have a social media strategy. For help developing your 21st Century Marketing Strategy, or to find out more about our low cost, high ROI training programs, contact us today. You’ll be glad you did. UPDATE: Join us for a free webinar Thursday, September 10th at 9PM Eastern. Trying to make sense of Twitter? Befuddled by Facebook? Not sure where to start? In this informative 90-minute webinar, David G. Johnson will be talking about how to decide which social networks make the most sense for your business, how to get started, and how to ensure that your precious time and resources aren’t wasted. Whether you’re an experienced social networker or not even sure whether to stick your toe in the waters, you can’t afford to miss this valuable educational event! In addition to lots of great instruction, there will be a Q&A session at the end which allow you to get your questions answered by the expert! David G. Johnson is the founder of Epiphany Marketing, LLC and has been helping businesspeople just like you establish highly profitable, cost-effective marketing strategies that leverage technology for the past 11 years. 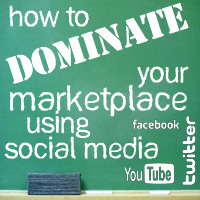 Will there be another opportunity to take the webinar How To Dominate Your Marketplace Using Social Media? Thanks! Yes there will! We’re working on posting a replay but also planning to hold another event soon. Watch this space! Thanks very much!